A rendering of The Don Miller and Ron Simons Rose Float Lab and Legacy Fence. The Rose Float Lab is planned to be completed in early 2020. 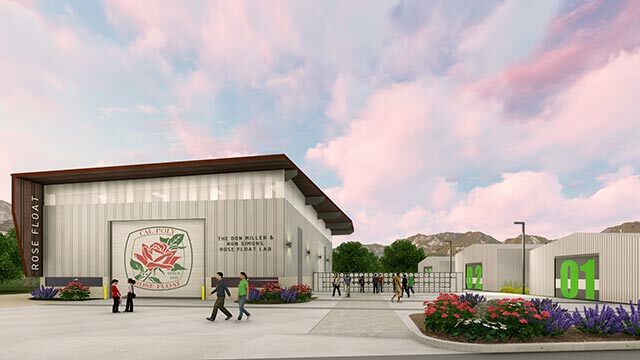 Cal Poly Pomona’s new Rose Float Lab and Design Complex will be named in honor of Don Miller and Ron Simons, alumni who jumpstarted and carried on the campus’ 70-year legacy in the Tournament of Roses Parade. The CSU Board of Trustees approved the naming before the lab groundbreaking ceremony, which will take place Saturday, Nov. 17. 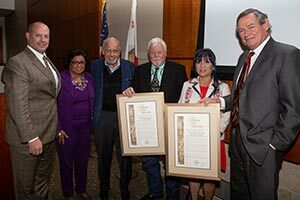 Alumnus Wilford “Butch” Lindley (’67, agronomy) and his wife, Vivien, donated a lead gift of $1 million to help fund the $3.7 million Rose Float Lab, and requested to name the building after Miller and Simons, honoring their efforts in the award-winning program and exemplary polytechnic experience. Simons influenced Lindley to join the Rose Float program when he was a student and has been a member of the Alumni Association’s Rose Float Chapter for more than 40 years. The Don Miller and Ron Simons Rose Float Lab will provide a collaborative working space for Cal Poly Pomona and San Luis Obispo students, staff and community to elevate their tradition of innovation in creating original floats to parade down the streets of Pasadena on New Year’s Day. With his studies in agronomy and passion in vineyards, and after serving in Vietnam where he earned a Bronze Star, Lindley co-founded J & L Farms, Inc in 1974. The company, along with Lockwood Vineyard, primarily raises and harvests grapes across nearly 6,000 acres in Northern California for wineries. He is also a partner in Coastal Wine Services, a wine and beverage storage and shipping facility that can hold more than 300,000 cases. The Lindleys are committed to giving back and staying involved in their communities. Along with the lead gift for the new Rose Float Lab, they created the Wilford B. and Vivien Lindley Endowment in support of the Don B. Huntley College of Agriculture. 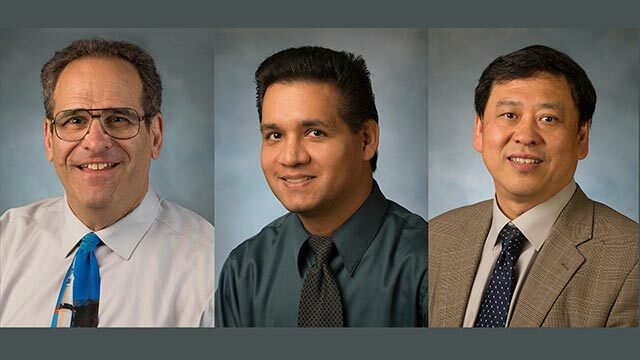 Cal Poly Pomona recognized Lindley’s career achievements and involvement in the university with the 2017 Distinguished Alumni Lifetime Achievement Award. 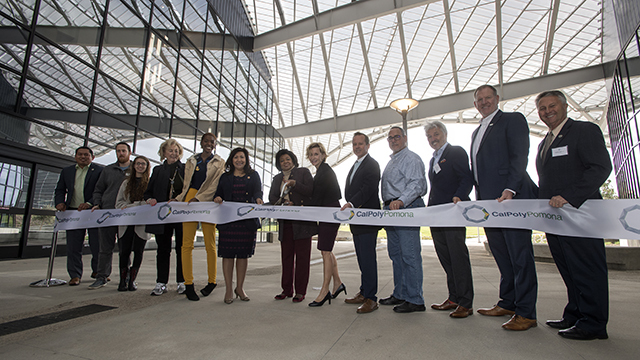 Cal Poly Pomona donors, Butch and Vivien Lindley, with alumnus Ron Simons, Chancellor Timothy P. White, Chair Adam Day and President Coley. 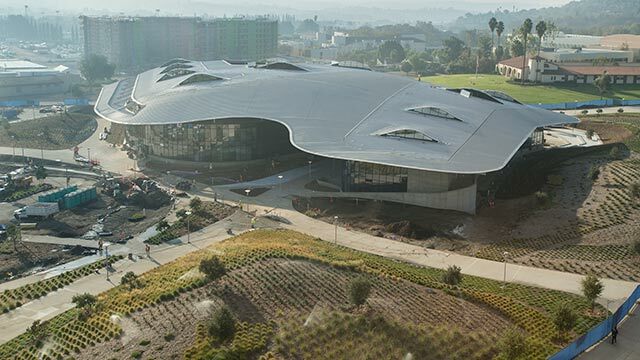 Expanding across a third of an acre of land along Kellogg Drive and Eucalyptus Lane, the facilities will feature indoor and outdoor work spaces, including a fully enclosed float construction bay, electronics and hydraulic shops, storage facilities and a courtyard to host more than 100 volunteers. 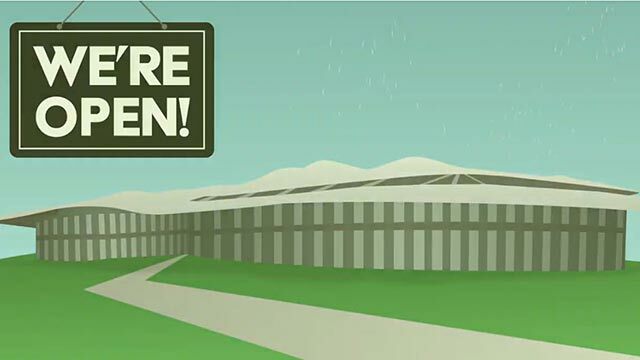 The entrance of the lab will be accented with an 8-foot tall, 60-foot-long sculptural Legacy Fence that will display 18-inch-square stainless-steel tiles honoring Cal Poly Universities floats, each tile laser-engraved with the year, float name and awards, milestones or innovations showcased in that year. The tiles will include the Cal Poly Universities Rose Parade debut on Jan. 1, 1949, “A Rocking Horse,” that came to fruition with Miller’s inspiration and drive, and the 1962 float, “Man on the Moon,” on which Simons rode as an astronaut in a spherical, rotating space shuttle that landed on the moon, seven years before Neil Armstrong’s epic accomplishment. 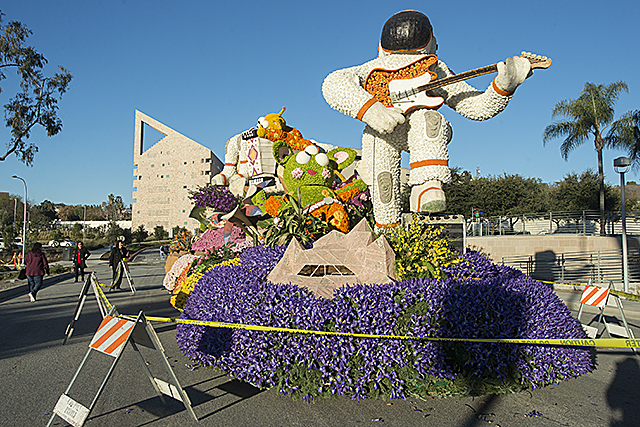 Partnering with students from Cal Poly San Luis Obispo, the Rose Float program provides students a first-hand experience in float design, construction and decoration. 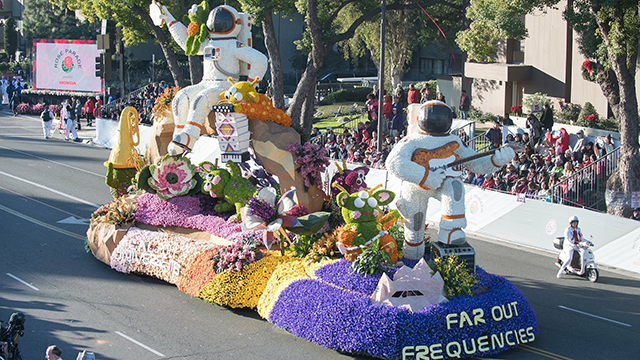 Competing against professional float designers, the universities’ team has won 58 awards, including the 2018 Past President Award for the most outstanding innovation in using floral and non-floral materials. Known for innovation, the universities were the first to use hydraulics for animation (1968), computer-controlled animation (1978) and fiber optics (1982). In 2012, they were the first to be certified as “California Grown” for using 85 percent of the fresh flowers from California growers. These awards and recognitions are credited to the commitment students bring each year to elevate the standards of what is possible in their float designs.